Members of the Hobbs Fire Department Honor Guard flank E-4, the pumper that carried Carl Joe Standefer's coffin to Brunson Memorial Cemetery on Friday while Eunice Fire Department volunteers stand at attention on the truck. 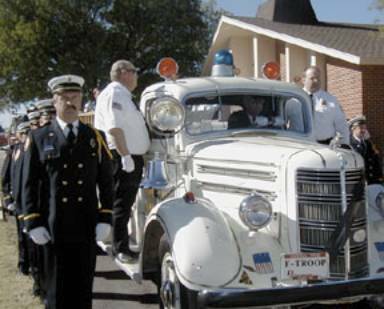 Eunice Fire Department members carry Carl Joe Standefer's coffin to the 1948 pumper truck that carried it down the city's Main Street on Monday while members of the Hobbs Fire Department Honor Guard stand at attention. 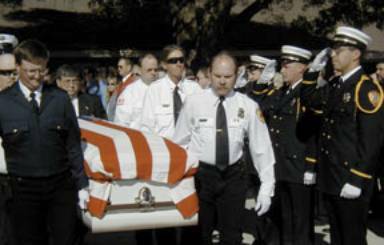 Carl Joe Standefer was known around the state as the man who helped build the New Mexico Firefighter Training Academy. But in Eunice, he was simply known as Carl Joe.That's why Main Street shut down on Monday as a funeral procession - that included a group of mourners on foot as well as more than a dozen firetrucks - made its way the mile or so from Calvary Funeral Home to Eunice First Baptist Church and a congregation who waited to pay their last respects. Mr. Standefer died at his home in La Puebla on Nov. 6 of complications from an aortic aneurysm. He was 73. And even though he hadn't lived in Eunice since 1971, Mr. Standefer was laid to rest at Brunson Memorial Cemetery with a sizable portion of the town's 2,700 residents in attendance. "This was home," said James Ray, who piloted E-4, the 1948 firetruck that carried Mr. Standefer's casket. "He started his fire career here." Born in 1927 in Oklahoma, Mr. Standefer was 10 when he moved with his family to Oil Center, near Eunice. His father worked in the oilfields for a short time, but later opened Standefer Grocery and Market on Main Street. Mr. Standefer worked at the grocery store and volunteered with the Fire Department, but joined the Navy when he was a junior at Eunice High School. He served as a medical corpsman, then returned to Eunice to finish school, also returning to work at the grocery store and the business of fighting fires. He eventually became chief of the 30-member volunteer department and held that position when Ray first joined the department in 1966. "I would have followed Carl Joe into anything," Ray said. "I guarantee you this department made tremendous advances under his leadership." One of those advances included the acquisition of a brand spanking-new, 1,000-gallon-a-minute pumper, the first truck of its kind in the area and one that Mr. Standefer flew to Elmira, N.Y., to pick up, then drove back to Eunice in the winter of 1970. "I can look at that truck there and it's him," Ray said tearfully of the vehicle that led Monday's procession. It was during the 1970s that Michael Patterson came to know the Standefer family. Fortunate enough to graduate with Mr. Standefer's son, John, he also participated with the active family in everything from cave exploring to water skiing. "Their house was always open," Patterson, now a Hobbs resident, said after the procession passed him on Avenue O. "They were really good people." Further down Main, Sharon Martin watched as E-4 neared the church. "I came because I just remember Carl Joe being at the grocery store all the time," Martin said. "My mother was a checker back then." But you didn't have to be from Eunice to know Mr. Standefer, who moved from town to join the State Fire Marshall's Office in 1971. He later became the state's fire marshal and it was during his time in office that the $8 million New Mexico Fire Academy opened at Socorro. John, who said the academy was his father's dream, is now its director. That's why members of the academy as well as the State Firefighters Assoc. also marched along the route. And fire trucks from large towns as well as tiny towns - places like Happy Valley, Causey, La Huerta and Dexter - were in Eunice. "Most of those guys in that procession are volunteers," Seminole volunteer firefighter Jay Miller pointed out as marchers approached. "You're dependent upon the other person to keep you alive so you have a tendency to get close. During the fire season, you spend more time with your fellow firefighters than your family." Speaking of family, Pat Dodd, Mr. Standefer's nephew, also marched, taking note of the vacant lot where the family grocery store once stood as well as the unusual show of manpower from across the state. "I cried and laughed. I didn't know what to do when I looked up and saw all those firetrucks," Dodd said. "He would have been mad because we were wasting all of this equipment, but there's not a firefighter in this state who didn't know him." And surely there's wasn't a firefighter in the crowd who didn't get a chill when the notes to "Amazing Grace" rang out at the graveyard. Dressed in a kilt and playing bagpipes, Harold Taylor performed the piece after the Hobbs Fire Department Honor Guard folded the flag from Mr. Standefer's coffin and handed it to his first wife, then gave his second wife Standefer's fire cap. A "10-98" tone out signaled that Mr. Standefer had finished his shift and finally, Eunice Fire Chief Kelly Colvin reached up and clanged the bell on E-4 one last time. It's a ritual that dates back to horse-drawn days when firefighters signaled their safe return. "It means he has returned to quarters for the last time," Ray said of the farewell to a fireman known statewide for his accomplishments, but simply known in Eunice as Carl Joe.